The Jewish Historical Society of Michigan invites you to help us collect, preserve, and celebrate the stories and achievements of Michigan’s Jewish women who helped build and shape our communities, institutions, and organizations. There are two ways you can participate. First, we invite you to attend the Michigan Women Who Made a Difference Jewish Voices Conference at Temple Emanuel in Grand Rapids on June 27, 2016. View of a copy of the conference brochure by clicking HERE. As you can see, a fantastic day is planned! There will be workshops, a luncheon and musical performance, and an afternoon panel discussion on barriers faced by Jewish women both yesterday and today. There is no charge for the conference, and travel stipends are available. We hope you will consider attending. To register, please mail back the attached registration form to the address listed on the form, or register online at www.michjewishhistory.org. Second, we encourage you to submit a biography of the Michigan woman in your life “who made a difference.” Biographies need not be long. You can download that form by CLICKING HERE. All we ask is that you complete whatever information you know. Beyond that, you are welcome to write a separate narrative about your Michigan woman to send to us. It can be as short as a few sentences if that is all the information you have. Every biography, short or long, is important. Please do not hesitate to contact JHSM at 248-432-5517 or tweissman@michjewishhistory.org if you have any questions. 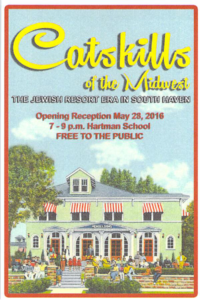 This entry was posted in Events, Uncategorized and tagged Jewish history, South Haven on May 18, 2016 by LH. 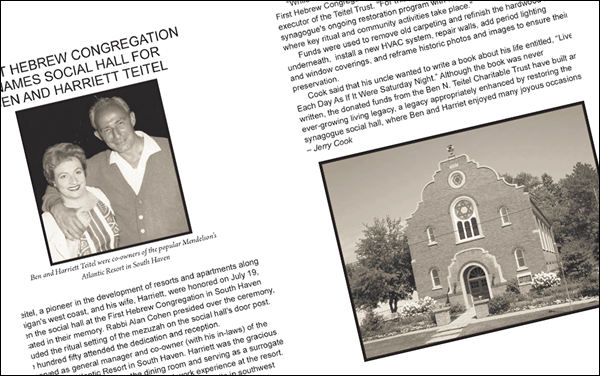 The recent renovation and dedication of the new Ben and Harriett Teitel Hall was recently included in the Jewish Historical Society of Michigan’s Fall 2015 newsletter. In case you missed it. You can read their article by CLICKING HERE. If you would like to sign up to receive the JHSM’s newsletter you can do that too! This entry was posted in Events and tagged Teitel Hall on January 15, 2016 by LH.